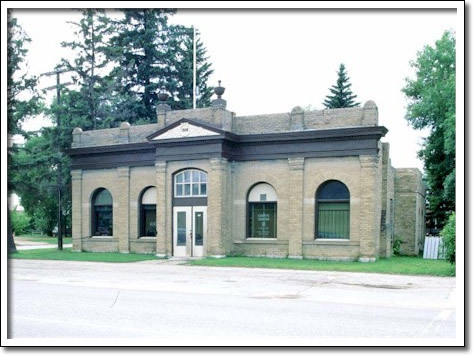 As Manitoba expanded during the last decades of the 19th century, a variety of government services—post offices, court houses, jails, and land titles offices—were placed in strategic centres. The competition for such services was intense, as these services not only provided economic benefits, but also confirmed local status. While land titles buildings were typically more modest than other government buildings, they were nevertheless given considerable attention in their appearance. The former Portage Land Titles Building, constructed in 1889, is a fine example of this building type. The original design came from E. F. Head, but was ultimately considered too plain in its façade design, and was refronted by Provincial Architect Samuel Hooper in 1906. Although modest in size, Hooper gave the building Neo-Classical distinction with a pedimented entrance, a deep cornice supported by brick pilasters and urns on the parapet.